A home’s entertainment setup used to get everyone piling up in the family room, trying to catch a peek of the TV or craning to hear the stereo. Times have certainly changed; now you can stream films, TV shows, and music everywhere in the house. Enjoy a movie in your home theater with your family, watch the game on the screen by your pool and grill, or get comfortable in bed to binge your favorite series. Of course, media in every room means that homeowners throughout Windsor, CO need an easy way to manage it all. Don’t worry: we’ve got you covered with audio video distribution. Read below to see how this technology can make experiencing your entertainment that much more enjoyable. SEE ALSO: What’s Most Important for Home Theater Design? Audio video distribution makes managing media much simpler. Every bit of entertainment tech is shared through one input, with no extra equipment or servers required. This means multiple displays and screens, but only one device to make it all happen. There’s less worrying about the clutter and nuances, and more deciding where you’d like to kick back, relax, and enjoy your media. The possibilities are endless with a distribution system. Your devices don’t decide where you watch something – you do. Now if your desired TV is in the bedroom and your cable box is in the family den, you won’t have to settle. 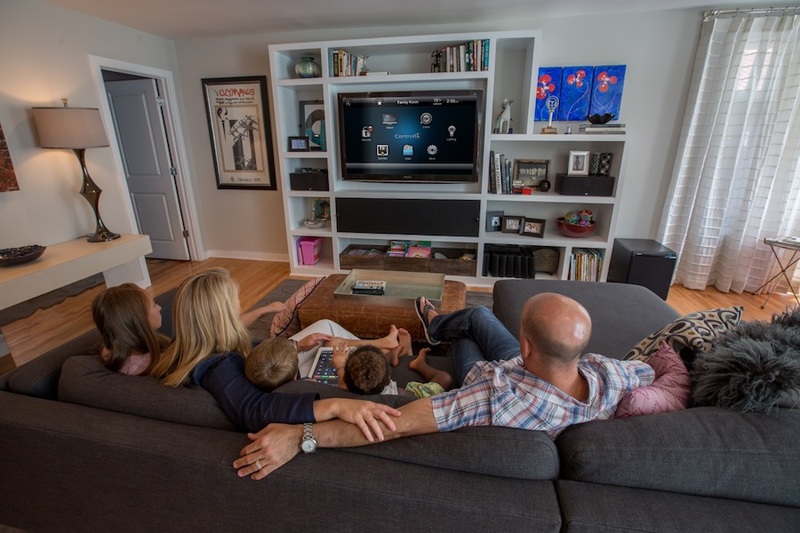 With an audio video distribution system, you can watch and listen to your media on any screen and any device – in any room. Listen to your favorite album downstairs, and finish it in your bedroom just before you go to sleep. Watch the big game outside on the patio, and never miss a play if you grab a snack in the kitchen. With audio video distribution, there is never a need to compromise. Now there’s an easier way to manage less. You want access to all your media, but it’s just unnecessary to set up separate equipment and several controls in each room. A Control4 system lets you control multiple screens and streaming services from only one device. Listening to tunes and watching TV all over the house is as easy as picking up your iPhone or tablet. The power of smart control is in your hands. Your home’s décor won’t have to suffer due to an abundance of equipment installation or an excess of consoles and remotes. Every room will benefit from the one distribution system, and any of its components will be hidden in cabinets or storage closets and out of the way. Keep your home comfortable and to your liking – and your daily entertainment all within your reach. Bring convenient and accessible entertainment to your Windsor home, in any room. Learn more about installing audio video distribution by contacting us at (970) 217-7018 or online through our contact page.